Through informal conversations with some women both immigrants and from the suburbs it came out that among these women there are needs, expectations and challenges of whom lives in contexts where personal initiative is often frustrated by the lack of computer, language and business education. In complicated social enviroments which, tendentially, are carecterized by a patriarchal mentality, it is very difficult for women to put their lifestyle into question and to take challenges on a working level. For this reason, and also to respond to the need of an education capable to give constructive and tangible inputs, we have decided to create a space for these women. This space will take shape through training and comparision periods: on one side there will be a training moment about adult education adressess to operators, on the other side women will be supported to improve their computer, business and language skills. Computer literacy, as well as the basis of the English language and a first contact with business management concepts are regarded as a first step to the inclusion of these women in the labor market. As a consortium our goal is to provide, in addition to these skills, an overview of the European opportunities for women’s entrepreneurship, recognized by the Brussels institutions as an economic engine of considerable size. What this project aims to create is greater awareness of the capabilities, skills and opportunities that can be used to create cooperatives, social enterprises or other economic initiatives run by women. The project doesn’t only want to elaborate activities to improve computer, language and business skills, but it also aims to train the people who will allow the implementation of the local activities. 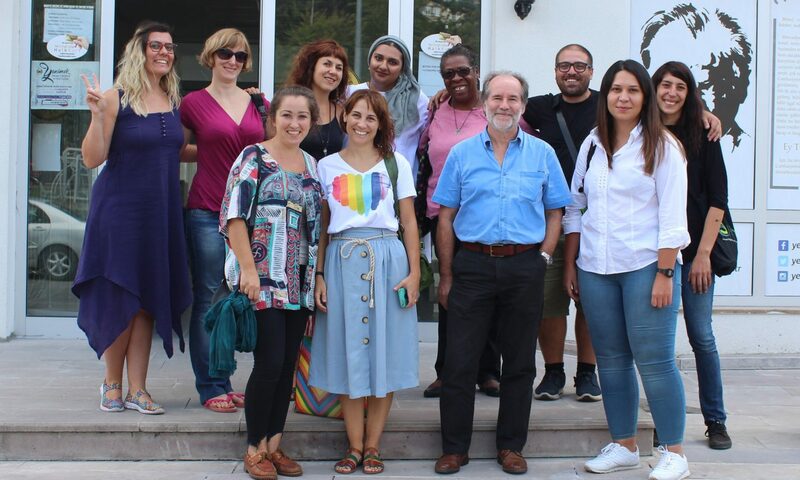 Once the young educators, volunteers and people who work in the social field participating to the mobilities, will go back their countries, they will be able, with the support of the sending organisation, to implement the gained competences at a local level. This approach on two levels will be completed with a third level of work developed by the consortium.The exchange work and the strong partnership will allow the consortium and the organizations that are part of it to improve their management in the specific area of adult education, helping increasing quality in local projects through the use of new methodologies and tools. PRIORITIES: The priorities of our project are to create two paths, one to train of educators with a specific focus on adult education, the other to build a training program for disadvantaged women. This will entail not just the employment of the two target groups but it will also generate an improvement of adults training courses such as computer, linguistic and economic / entrepreneurial knowledge. Skills increase of the women involved in the project. Increased knowledge of Youth Workers about adult education through the mobility period and the organization and coordination of local activities with the target group. Creation of a local, regional and international network regarding adult education and women’s entrepreneurship. Conducting surveys about European policies to probe the knowledge of the various European opportunities for women. Creation of a radio linked to the project for the transmission of programs related to the themes of the project. Development of a communication and dissemination strategy for the project results. The research results and the sharing of ten good practices that promote the engagement of women and their creativity in entrepreneurship. The analyzed and experienced good practices will be made available through the development of a Booklet, this will be created following a model practical and easy to replicate in each partner country. The entire booklet will then be uploaded on the project web site, in order to be accessible to all users. Job placement of fifty women directly involved in the learning process. Creation of an international network composed of different realities such as: associations operating in the social sector, public institutions, universities and employment centers. Survey on the impact of European policies regarding employment. Birth of an international radio that promotes European opportunities for women entrepreneurship and that shares the successes achieved by those who have benefited from such opportunities. Growth of the media visibility of the Erasmus Plus program and of European women’s opportunities.